Before I start this post I want to point out two important notes. The first is related with the to the haste in the elaboration of this post, because this weekend the media will be saturated with this "nationalization" I want to present my ideas in advance. The second is related to one of my debt to my friends of Abya Yala TV, last week I couldn't attend a kind invitation to discuss these issues, I hope that time will work and our friendship will win this fault completely mine. It has been ten years of a measure that had, as its main merit, the big media impact. During these ten years this so-called "Nationalization" was widely used in the media; however, its strictly technical implementation is still unknown, just remember that during this period the provisions of Articles 6 and 7 of 3740 Act enacted in 2007, was not fulfilled. There are already several occasions where I point out that the current Bolivian oil industry would not be what it is, without the work of many Bolivians in the past and the remarkable growth in international oil prices. This time I want to introduce some figures on the same idea, so I invite you to see the following figure, where I show total wellhead revenues under two scenarios: 1) the first one doesn't consider the export contract to Brazil (and Argentina) and keeps oil prices at levels observed in 2000; 2) in the second I present the Bolivian wellhead revenues actually observed, I mean, including exports and the impact of high international oil prices. So dear reader, without the Bolivia-Brazil pipeline implemented in the past (before Mr. Morales) and without international high oil prices, the total wellhead revenue (the size of the cake) barely reach US$ 400 million annually. I mean, during the period 2006-2014 the total wellhead revenues observed (and harvested) were slightly higher than the US $ 38 billion; with no Bolivia-Brazil gas export project and without high international oil prices wellhead revenues are just over US$ 3. In other words, without the project to Brazil and without international oil prices high... really there had not been much to "nationalize". One of the arguments often used to justify the so-called "nationalization" is related to the ownership of hydrocarbons, it's argued that through this process "Bolivians recovered the ownership of hydrocarbons." Well, let's see what the numbers tell us. 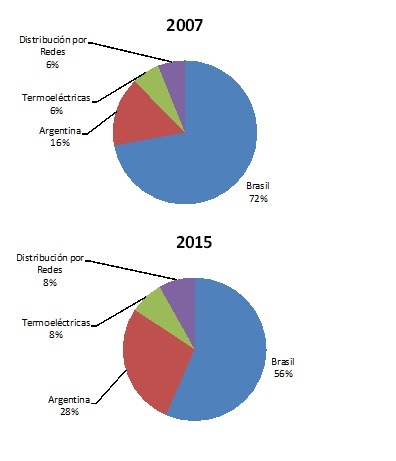 In the following two figures I present the markets of Bolivian natural gas production, in 2007 88% of total production was exported as raw natural gas to Brazil and Argentina; meanwhile in 2015 this figure reaches 84%. Thus, despite the feeling of pride that we could have since 2006 because this so-called "nationalization", in fact, we keep doing the same... export natural gas as raw material. 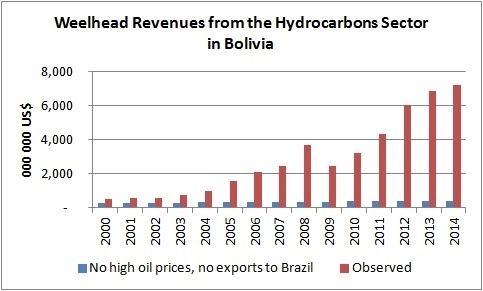 It is also argued that the substantial tax revenues from the hydrocarbons sector in Bolivia are due to the "nationalization" of hydrocarbons. Again, let's see what the data says. 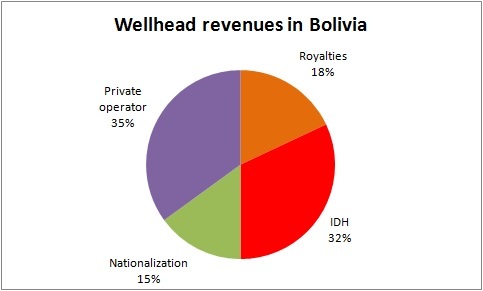 The following figure shows the division of the wellhead revenues (the size of the cake) in the Bolivian hydrocarbon sector. As you can see the "bulk" of fiscal resources for the Bolivian state comes from the Direct Tax on Hydrocarbons (IDH), tax created in 2005 (a year before the process called "nationalization") and promulgated by the President of National Congress at that time, Mr. Hormando Vaca Diez. In fact, this is the tax "distributed" to municipalities, regional governments, indigenous fund, etc. Revenues from the so-called "nationalization" exclusively benefit YPFB (Bolivian state oil company) and can be, as example, "15%" or "1%" according the natural gas field economics. So is there any merit in the so-called "nationalization"? Indeed yes, it's the neoliberal nature of the process. The percentage that in the graph appears as "15%" is variable according to market and production conditions, in other words, whenever the private operator "get more profit" pays more to YPFB. In this sense, the fiscal instrument created with the so-called "nationalization" it's a progressive rate applied on the profit of the field operation. This May 1st. surely will come full of commercials and heated speeches gracing with flowers the so-called "nationalization" process, I only ask you dear reader, that at that time you will remember the ideas expressed in this post and thus, perhaps, achieve have a more balanced vision of this process. Once again the dance of the billions of dollars will be the central act of this play were balconies are reserved for the chosen ones, while the rest simply will applaud in order to not lose that old wooden chair that shares with his family .